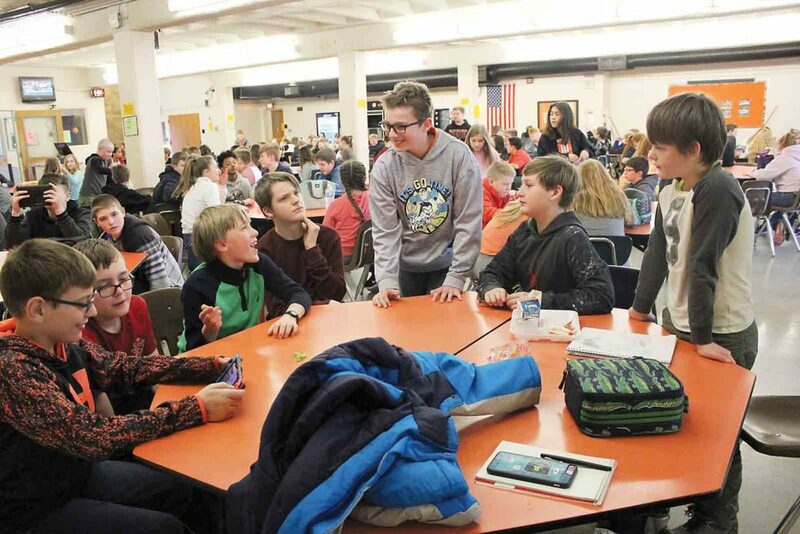 Photo by Janelle Patterson On Tuesday Ethan Mcalarney, left, Gabriel Fournier, David McGraw, Reese Daff, Kasey Worstell and Michael McGraw, gather around Taten Ayers, center, with words of encouragement as Ayers prepares for Friday’s regional spelling bee. 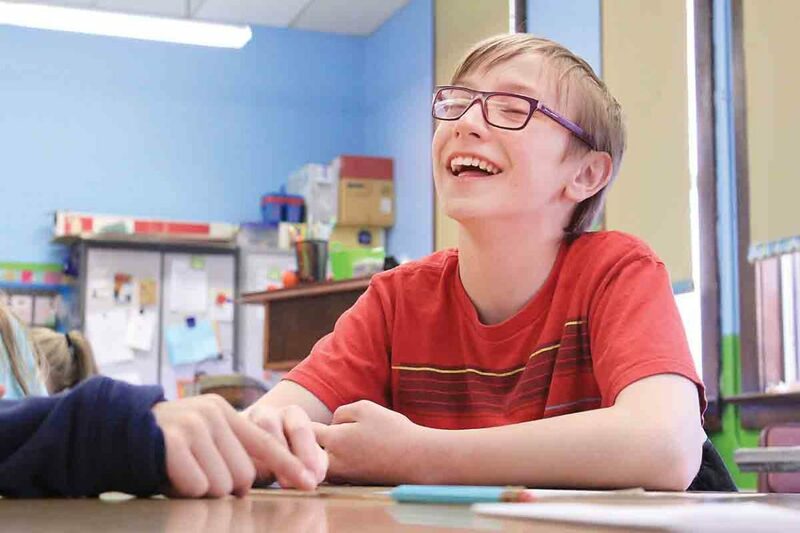 Photo by Janelle Patterson Matthew Taylor, 12, of Williamstown laughs as he builds an alliterative acrostic poem with classmates in Shannon Offenberger’s sixth-grade language arts class at Williamstown Elementary School Tuesday. Photo by Janelle Patterson Dania Atwat, 10, of Devola studies spelling bee vocabulary words Tuesday in her home. 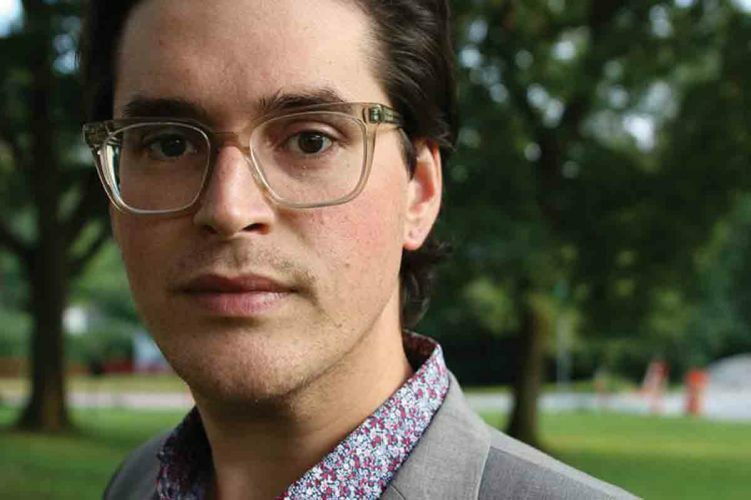 MARIETTA — Imagine using the word “pneumonoultramicroscopicsilicovolcanoconiosis” in a sentence or memorizing its spelling and its root. That’s what Taten Ayers, 11, of Lowell has been practicing for the past few months. “It’s a disease that volcanists get from the silicon in the air they breath during their work,” the Marietta middle-schooler said of the 43-letter word. With the bated breath of friends and family, Ayers and another 63 local students will compete Friday in The Marietta Times Regional Spelling Bee. The bee will begin at 7 p.m. at the Marietta High School Auditorium with spellers arriving for registration by 6:30 p.m. The event is free and open to the public. 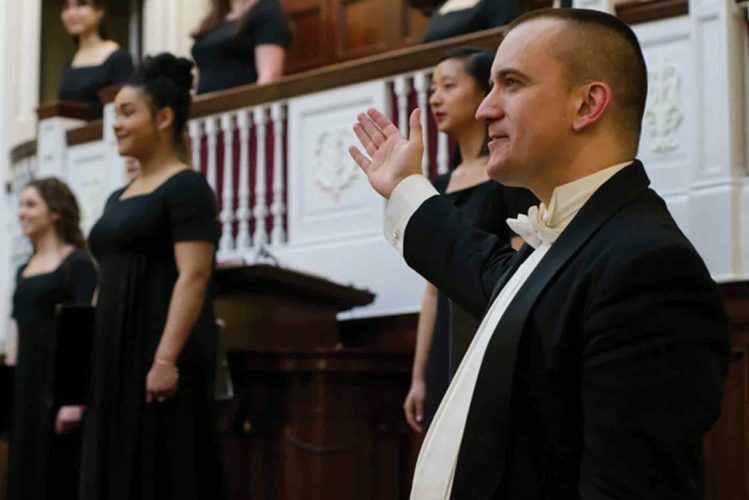 Participants have been busy practicing since being selected through school and district contests. The contest includes the top spellers in fifth through eighth grade from a dozen school districts across Washington, Monroe, Noble, Wood and Pleasants counties. And the lists of words have been scrutinized, deconstructed and repeated over and over by these children looking to win and head to Washington D.C. in late May for the Scripps National Spelling Bee. Hannah Archer, 13, of Churchtown is hoping with her use of the Scripps spelling bee website’s online study tool she might take the regional title this year, after three previous years in the top three spots, the last two as runner-up. Matthew Taylor, 12, of Williamstown said since it’s his first time at regionals and he’s a little nervous about pronouncing some of the words, but practicing several hours each night with his mom has helped. “Last night we were waiting for my brothers to get done skating so we sat in McDonald’s and studied,” he said. 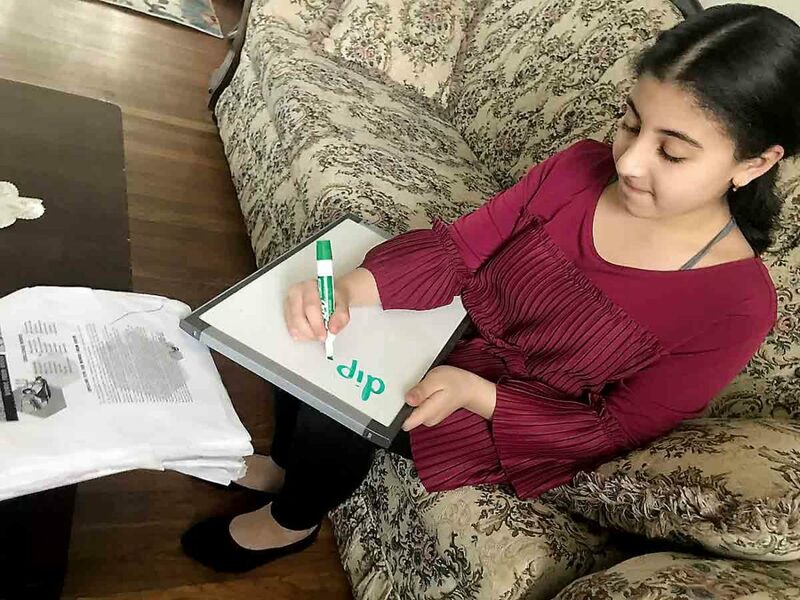 And for Putnam fifth-grader Dania Atwat, 10, of Devola who wants to be a pediatrician when she grows up, studying has included going over words with her mother, Majeda Al Waked, and writing them on a small whiteboard. But her favorite word thus far has an origin in Atwat’s second language. “The word ‘Swahili’ because it’s origin is Arabic,” she said. The participants’ friends are just as excited to see their peers compete at the bee. “Matthew (Taylor) is not only a great speller but he’s also a great saxophone player,” said Williamstown Elementary classmate Garrett Shipley. Likewise, the “Raptor Pack,” Ayers’ friends, were brimming with praise at lunch with Ayers Tuesday. “We were in the bee last year and now we want him to do even better,” said David McGraw, who competed with his twin brother Michael. All four contenders said their participation in the bee was rooted in a love for reading, and for understanding where words come from and what they mean. 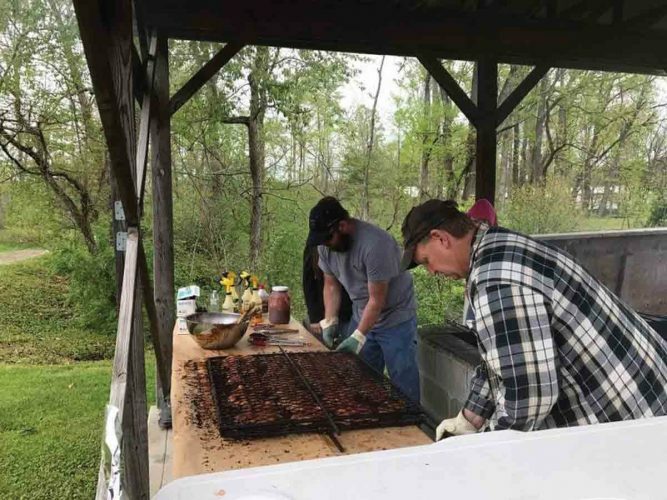 Ayers’ mother Heather said the bee has become a family tradition. She also participated when she was a child as did her sister and daughter, who took second place in the regional bee in 2009. “So there’s a little sibling rivalry there but we also get to apply tricks to studying that you learn after doing it so often,” she said. Atwat’s mother said Dania has worked diligently on her own to memorize word spellings and roots. * The Marietta Times Regional Spelling Bee will begin at 7 p.m. in the Marietta High School Auditorium Friday. * Spellers are to arrive for registration between 6 and 6:30 p.m.
* The event is free and open to public viewing. * The winner of the regional bee will go on to the Scripps National Spelling Bee to be held in the Washington D.C. area at the end of May.